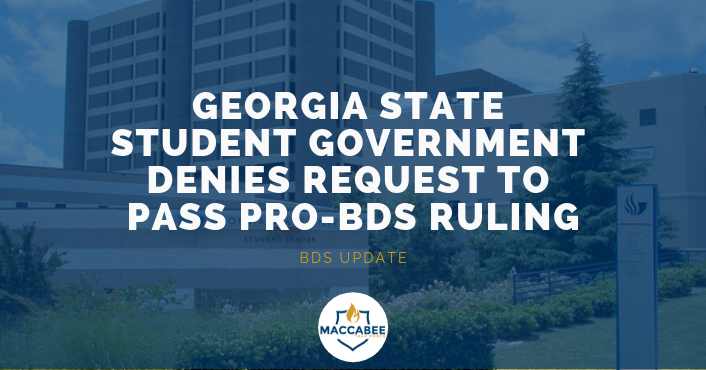 Georgia State University (GSU)’s Student Government Association (SGA) denied requests to take up pro-Boycott, Divestment and Sanctions (BDS) legislation on January 16, citing state law on the matter. According to a letter from the school’s SGA to the students, some student groups on campus – including Faces of Feminism – were upset by SGA leaders attending the Maccabee Task Force’s trip to Israel in December. The groups demanded at a January 11 SGA meeting that the student government apologize for attending the event, pass the pro-BDS legislation and then have SGA University-Wide President Franklin Patterson, executive vice-president Ayesha Iqbal and communications director Kalisha-Lourdy Lazare resign over the matter. The letter stated that none of these demands would be fulfilled. “As a state-funded school, the decision in regard to actionable BDS legislation either supporting or disagreeing will be determined by the Board of Regents and our state legislators,” the letter read, referring to a 2016 state law that requires state contractors to certify that they are not boycotting Israel. The letter added Patterson and Iqbal attended the trip “as individual students in order to gain more knowledge and an educational perspective” on the Israel-Palestinian conflict. According to the Georgia State Signal, the campus newspaper, after the January 11 meeting, the angered groups confronted Patterson, Iqbal and Hamza Rahman, an SGA senator who had been involved with the campus Muslim Students Association on the matter. One of the protesters said “May s*** be upon you” to Rahman in Arabic, prompting Rahman to respond with, “May s*** be upon you too, you child of a donkey” in Arabic. Rahman later apologized for his language.